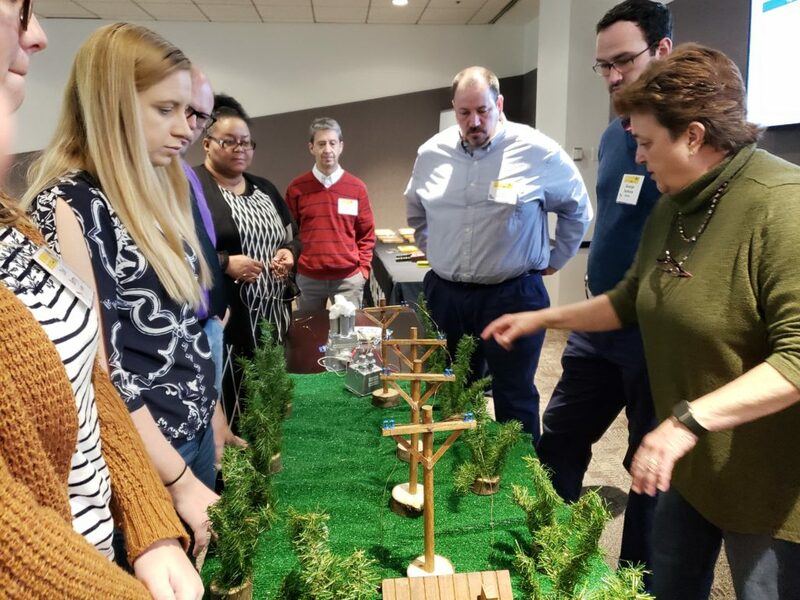 Representatives from North Carolina’s electric cooperatives brought hands-on energy learning to teachers from across the state this week at the second annual emPowering STEM conference. The event, coordinated by the North Carolina Business Committee for Education and the Kenan Fellows Program for Teacher Leadership, brought middle school science, technology, engineering and math (STEM) teachers together with representatives from STEM-focused industries to learn about job preparedness and ways to incorporate hands-on STEM lessons into their classrooms. Jamie Mosley, far right, shows a group of teachers how the grid they have constructed can be used to teach their students about electricity. At the cooperatives’ Energy Lab, Surry-Yadkin EMC System Planning Engineer William Hawkins and Four County EMC Director of Safety Brent Croom joined co-op Kenan Fellows Jamie Mosley (2014, Surry-Yadkin EMC) and Rebecca Brown (2017, Four County EMC) in leading attendees through the “rural path of electricity” activity. Teachers formed a cooperative and built a mini electric grid. They learned more about how electricity travels from the source of generation to a home, and discussed electric safety, power generation sources, and the cooperative business model. Representatives from Siemens Energy and Duke Energy also participated, providing an outlook on available jobs and workforce development from the Carolina’s Energy Workforce Consortium. The “rural path of electricity” project was developed by Mosley during her Kenan Fellowship with Surry-Yadkin EMC. She continues to use the grid models each year to teach her students how electricity powers their homes, and the reach of her work is growing. In 2018, three teachers from Catawba County who had seen the grid model in action at the first emPOWERING STEM conference won a Bright Ideas grant that will bring a project inspired by Mosley’s activity to all middle school students in Catawba County. The emPOWERING STEM conference is held annually by the North Carolina Business Committee for Education and is focused on bringing business leaders and educators together in hands-on learning environments. To learn more, visit the NCBCE website.